The Google Transparency Report is designed to point out government censorship, requests to Google for data, and other details about our information services. The newest report, just out this week, shows that government requests for content removal have reached a new high level, with more than 2200 requests received in the second half of last year. 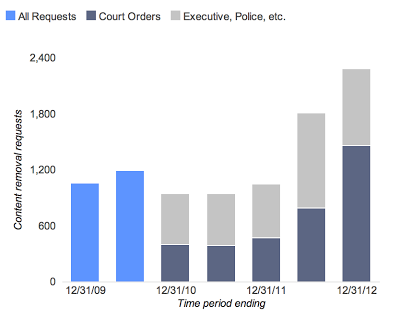 Government removal requests are probably the best known part of the Transparency Report, but there’s plenty of other fascinating and useful data. For example, you can see information about removal requests for specific URLs from copyright owners, or read about the legal process that takes place when a government organization or court requests information about a user. You can learn a lot by spending some time with the Transparency Report. If you’re on the U. S. East Coast this spring and summer, you won’t need a report to tell you that massive numbers of cicadas are emerging from their underground homes to breed, fill the skies, annoy countless humans, last a few weeks, then die (and annoy even more humans who have to clean them up). This year’s bunch are Magicicada septendecim, or periodical cicadas with a 17-year life cycle. So we can look forward to a similar event in 2030. Finally, if you haven’t already played with the Earth Day Doodle from last Monday, consider taking a few minutes this weekend to enjoy it. You might find yourself mesmerized by the tranquil scene (cicadas not included). Fridaygram is mostly about fun and informative stuff that’s not related to development, but we seriously want to congratulate Googlers Peter Norvig and Arun Majumdar on their election to the American Academy of Arts and Sciences. Arun runs Google’s energy strategy as vice president of energy, and Peter is our director of research, although he’s also known for his whimsical take on presentations and technology.